This is how your sewn up pear will look before you turn and stuff it. The stuffing part is what I think is the most important step in your pear creation. Try to remember all those wonderful pieces of fruit you've enjoyed and "think pear" as you stuff your creation. You know that nothing is perfect. Pears have lumps and bumps (and bruises which you may want to add too!). Your pear should not be perfectly symetrical and the top will probably lean to one side or the other. Use strong thread and make a running stitch around the opening in the bottom. Gently gather the thread and make a knot to close up the pear. You may want to add some weight to the opening before this final step so your pear will sit properly. This could be a metal washer or steel shot. As you sew, you may want to leave a few thread's width open at the top for you to insert your stem. If you've sewn it up, you can always use an awl to create a place for the stem. Dip the stem in some tacky glue before inserting and add a drop or two of a fray check product around the stem to prevent raveling. In the words of my special friend and clay instructor, Beth, "Does this make sense?" ********JUST A NOTE: The first part of this tutorial is titled "Let's make this pear pincushion" and can be found listed on 10/19/10. Thanks for the interest!!! Lady Buggly on Ebay Tonight! Sneak Peek for Lady Buggly! 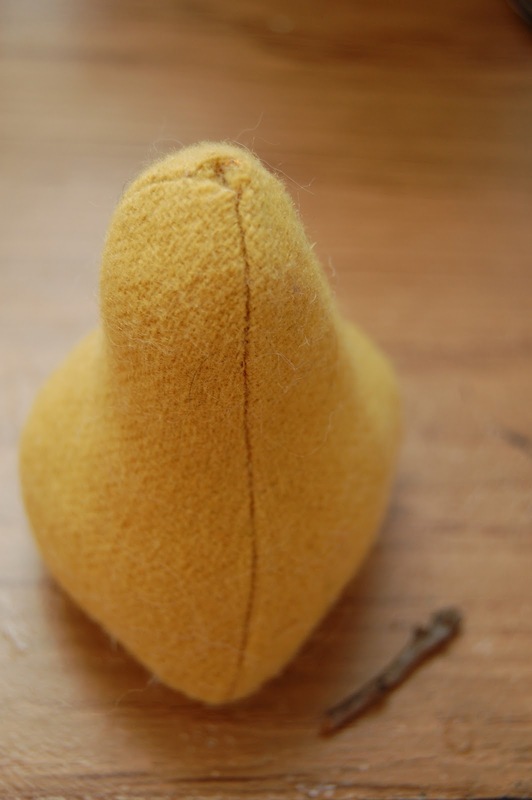 Let's make this pear pin cushion! Would you like to make a pear pin cushion? Golden Teddy Award Winner - Lady Buggly!